Enjoy Complimentary Golf Fees in Riviera Maya at Now Resorts! Foreeee! Grab your woods and irons — guests of Now® Jade Riviera Cancun and Now Sapphire Riviera Cancun can enjoy complimentary golf fees in Riviera Maya at not one, but TWO nearby golf courses! Keep reading for more info! Take to the green for a vacation fit for the golf enthusiast at Now Resorts! From golf pros to rookies, look no further than Now® Resorts & Spas for the vacation you’ve been looking for! Guests who stay at Now Amber, Now Jade and Now Sapphire can enjoy complimentary green fees at nearby golf courses. Read more to learn about the golf experiences offered to guests when they visit Riviera Maya and Puerto Vallarta! Guests at Now Amber enjoy the complimentary green fees at one of two 18-hole courses! Get in Golf FOREmation with Complimentary Greens Fees in the Riviera Maya! Interested in trying a new activity or keeping up with a favorite sport while on your vacation getaway? Now® Jade Riviera Cancun and Now® Sapphire Riviera Cancun have got you covered! At Now Resorts & Spas in Riviera Maya, guests enjoy complimentary greens fees. No better way to get a workout in or enjoy some fun time outside than by taking a few swings! Read on to learn more about this great perk! Enjoy complimentary greens fees at Now Jade Riviera Cancun and Now Sapphire Riviera Cancun! It’s #BeachThursday and we can’t think of any better way to celebrate than with a complimentary round of everyone’s favorite leisure activity: golf! 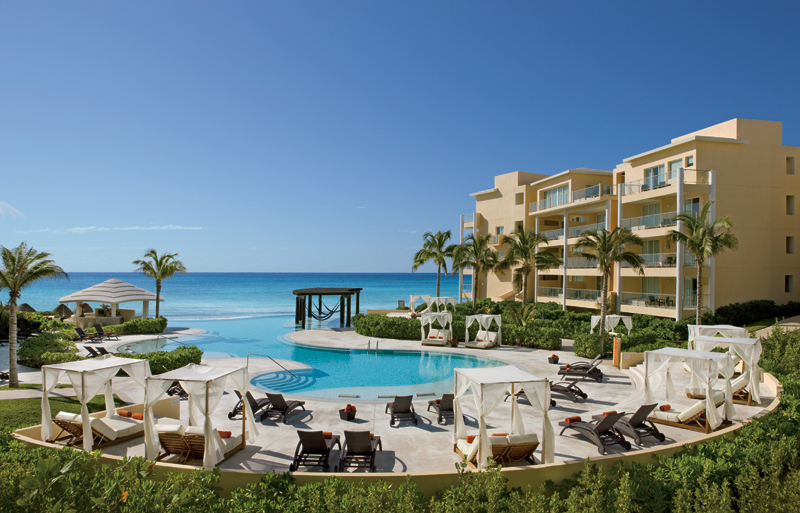 Set along 2,600 feet of pure crystal white sand and refreshing azure waters, combining understated sophistication with Unlimited-Luxury® amenities, Now Jade Riviera Cancun offers the perfect escape for couples, families and friends. 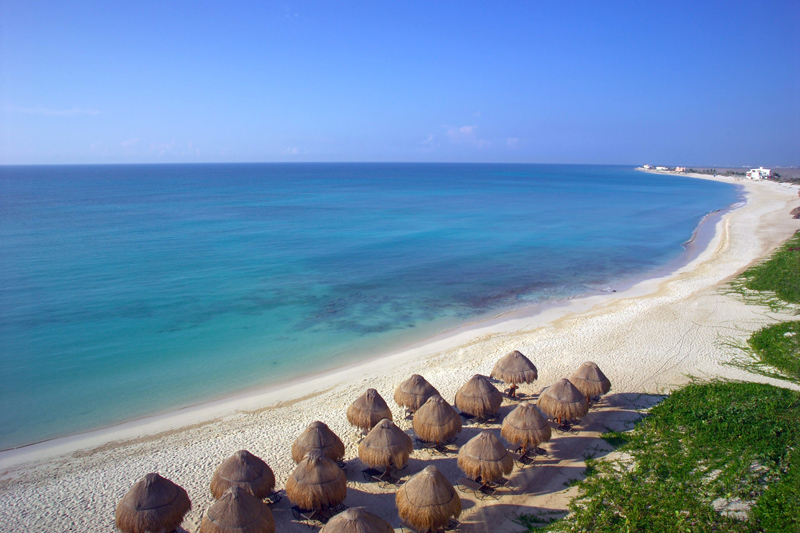 A view of the powder-white sand beaches at Now Jade Riviera Cancun. As if the gorgeous setting and endless amenities weren’t enough, now through December 31, 2015, all guests staying at Now Jade Riviera Cancun can enjoy a complimentary round of golf at the Grand Coral Riviera Maya Golf Course! Designed by PGA champion and golf course designer Nick Price, the Grand Coral Riviera Maya is perfect for pros and amateurs alike. Guests can hit the rolling greens in the beautiful Riviera Maya while overlooking the gorgeous Caribbean Sea! The quiet pool at Now Jade Riviera Cancun provides guests with a relaxing area to lounge and enjoy views of the Caribbean. Guests looking to take advantage of this special offer can visit the Now Jade website for pricing and additional details. Whether you’re a seasoned player or a beginner looking to brush up on their skills, Now Jade Riviera Cancun is the perfect place to enjoy a complimentary 18-holes amongst the sun and gorgeous blue sea! Book your escape, pack your clubs and experience all that Now Jade has to offer! Family Fun for Everyone at Now Sapphire! Finding a vacation that will make every member of the family happy is no easy feat, especially with kids of varying ages in tow! At Now Sapphire Riviera Cancun, however, we’ve got you covered and can guarantee a trip everyone will be talking about for years to come. Check out the below video for proof! We have activities available for all ages and every vacation style. Whether you’re into relaxing and unwinding by the pool or on our private stretch of white-sand beach, or taking to the sea for an ocean adventure, there’s something for everyone. 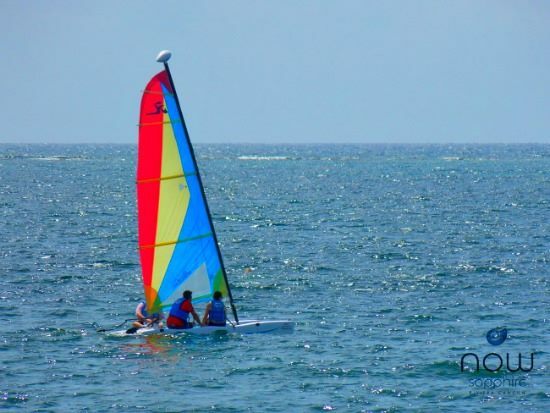 Water sports include sailing, kayaking, windsurfing, water aerobics, water polo and even snorkeling, deep sea fishing and scuba diving* for those looking to explore all the beautiful Caribbean Sea has to offer. There’s nothing like feeling the cool ocean breeze in your face! Explore the Caribbean Sea during your stay at Now Sapphire Riviera Cancun. Activities for land lovers include tennis, beach and water volleyball, beach soccer, ping pong, euro-bungee and bicycling tours. Plus dad will be thrilled to find out Now Sapphire Riviera Cancun guests receive complimentary green fees at the Grand Coral Riviera Maya golf course! 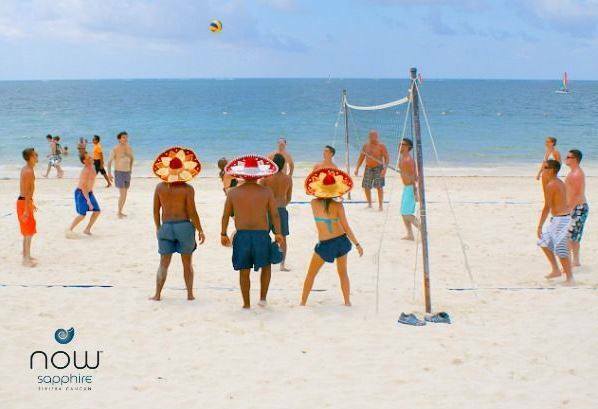 Get your blood pumping with fun games and activities at Now Sapphire Riviera Cancun! The fun doesn’t stop after the sun goes down, either! 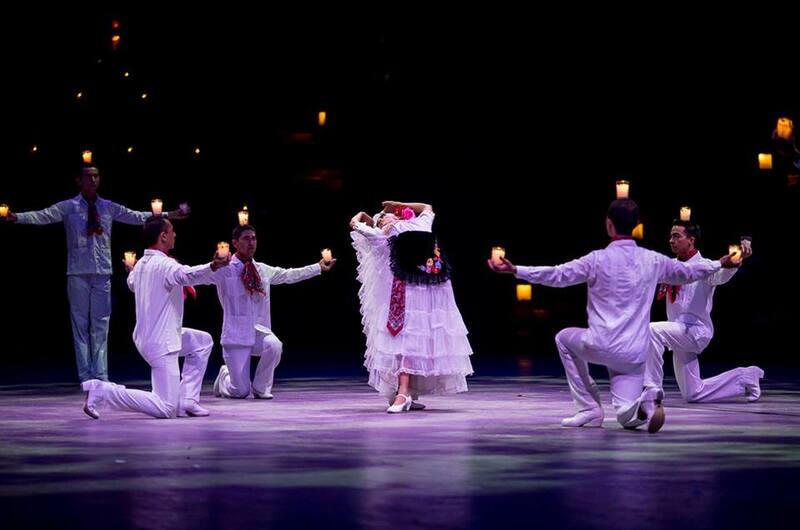 Guests of all ages can enjoy family-friendly activities and entertainment including big-screen movies on the beach, live shows featuring singing, dancing and authentic Mexican entertainment, themed parties for holidays, sporting events, award shows and seasonal celebrations, and guest involvement in karaoke and game shows! Are you ready for Now Sapphire Riviera Cancun? We can’t wait to welcome you to our unforgettable resort! Check out our special offers page for deals on your next vacation! Do you love to golf in your free time? Whether you’re a beginner looking to step up your game or an old pro, check out our complimentary greens fees at Now Amber Puerto Vallarta! Guests staying at Now Amber through June 30, 2015 can enjoy one round of golf at either the Vista Vallarta Club de Golf or Marina Vallarta Golf Club. 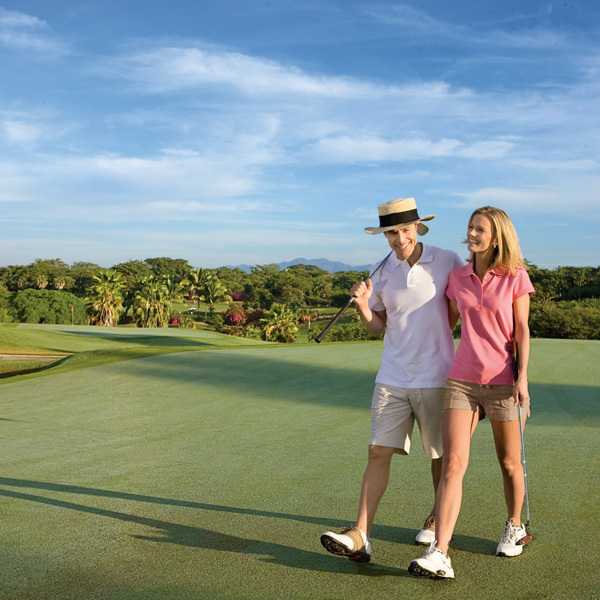 Enjoy a beautiful day on the golf course at Now Amber Puerto Vallarta! Vista Vallarta Club de Golf is composed of two 18-hole championship courses. One of these courses was designed by golf legend Jack Nicklaus, and the other by noted golf course architect Tom Weiskopf. Both courses offer the perfect setting for pro and amateur golfers alike. Marina Vallarta Golf Club is a magnificent 18-hole championship course. Golf course architect Joe Finger did a truly masterful job of blending the elevations and natural features into one incredible playing experience. Learn more about how you can hit the green here and book your stay with Now Amber Puerto Vallarta today! We have even more reasons why you will love your Unlimited-Lxury® stay in Puerto Vallarta! Perfect your swing with complimentary greens fees at nearby select 18-hole championship golf courses when you vacation Now Amber PuertoVallarta! Vista Vallarta Club de Golf and Marina Vallarta Golf Club both offer guests one round per person per day. Vista Vallarta Club de Golf boasts two signature 18-hole championship golf courses amidst some of Puerto Vallarta’s most picturesque surroundings. The first course offer breathtaking views of Puerto Vallarta, the Marina and the Bay of Banderas. The second course offers a golfing experience amidst dense jungles, deep ravines and swift creeks. Marina Vallarta Golf Club is an 18-hole championship course Finger featuring magnificent views of the Bay of Banderas and provides natural obstacles for golfers, including palm trees, tropical plants and natural lagoons along with abundant wildlife. These natural features have made the course increasingly popular among golfers. Arrange tee times at least 24 hours in advance with the resort concierge. All tee times are subject to availability. Read more details on the special offers page.